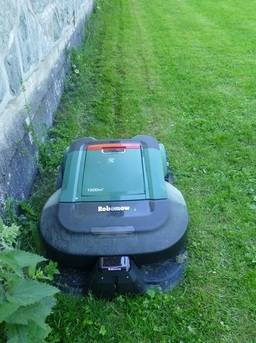 Robmow - a robot mower I would say, cousin of robomaid? It seems that it is always quiet when we arrive in major towns. It is a religious holiday today so most Oslo(ites?) were out enjoying the beautiful weather. We bypassed the city via a huge tunnel and emerged at the Bygody Peninsula with its greenspace, expensive houses and museums. Guy went into the Viking museum but I checked out the museum mowers (Robmower) and wandered around looking at the expensive houses. We drove on to Drammen just outside of Oslo and met up with Deb and Barb. Beautiful clear weather as we drove to the Heddal stave church, the largest in Norway. Then some stunning alpine scenery as we drove towards Stavanger. 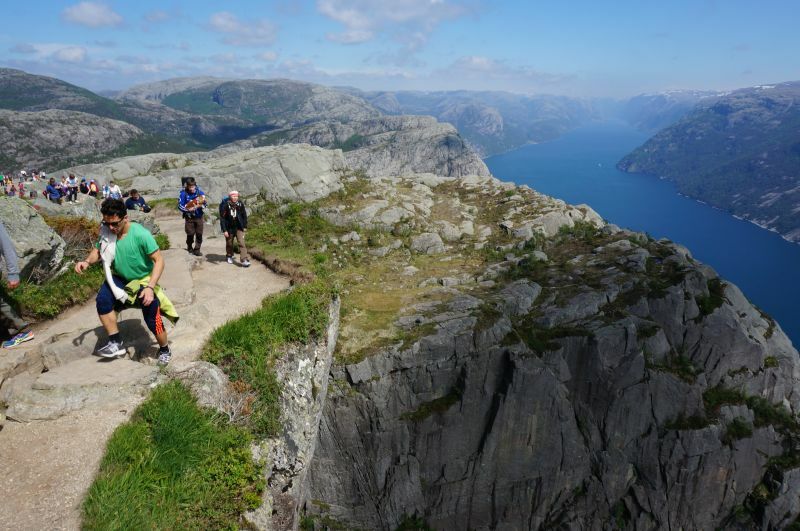 More spectacular scenery before arriving at Preikostolen where we prepared for the 800 metre climb to Pulpit Rock. 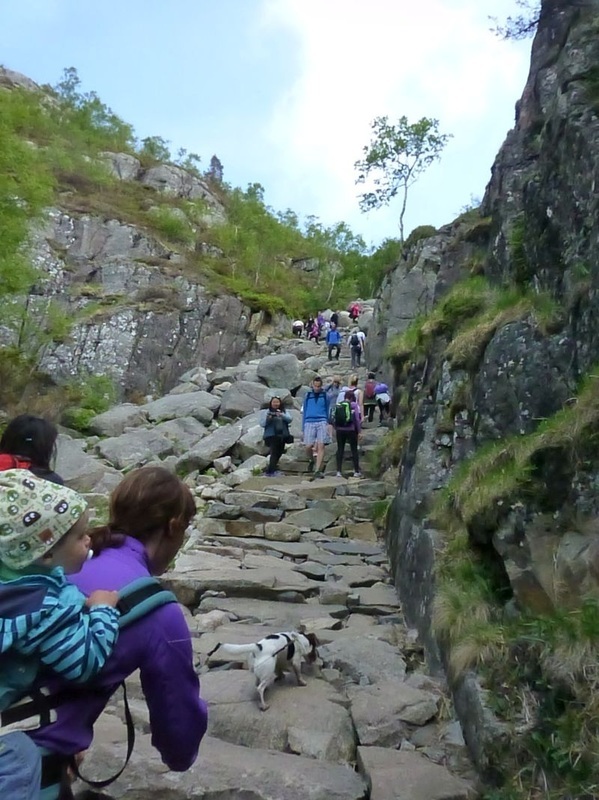 There were dogs on leashes, children being carried in backpacks and people of all ages and abilities walking the stoney uneven path to get to the sensational views at the top. Children and dogs making their way up the track. Deb and Barb on the track up. There's one in every crowd. Others were enjoying their Saturday afternoon barbacue. 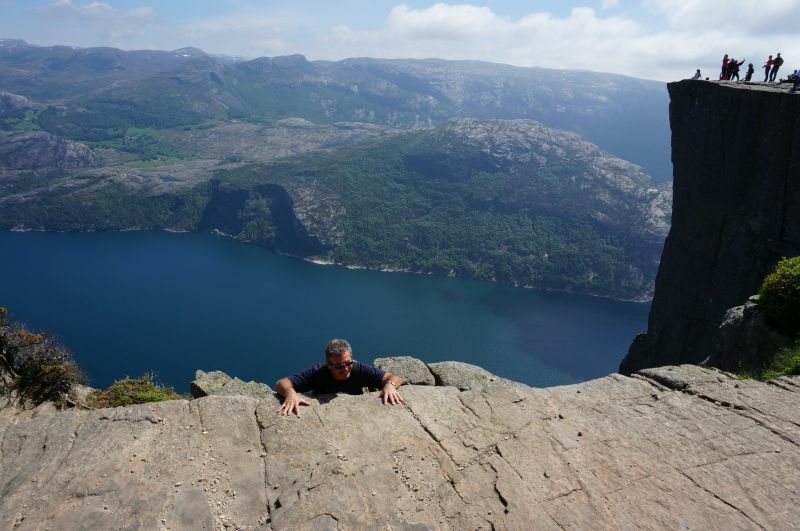 Left our Preikestolen campsite and headed towards the Hardanger Fiord. Just great weather to highlight the superb scenery. 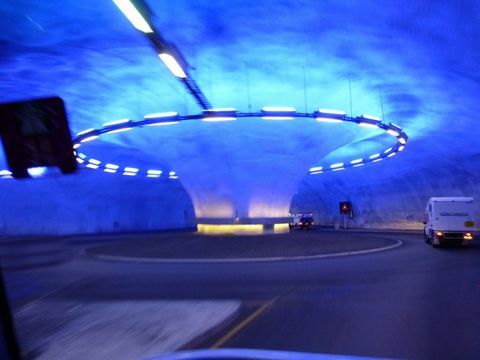 Norway has the most kilometres of tunnel per capita. We went through 43 tunnels today including one with a blue light area in the middle. We wondered what had hit us half way through this tunnel. Just a couple of hours to our Bergen camp, then we caught a bus into town. There was a cruise ship or two docked so the fish markets and the Bryggen area were alive with people. We walked a little way up Mt Floyen to look over the harbour and noticed some attractive timber houses along the steep climb. The switchback seen from the train. It was to be the start of the downhill ride. On our way to Flam we went throiugh an 11km tunnel and about 20 other shorter ones. I am starting to feel I spend more time under mountains and glaciers than above. Arrived in Flam, another cruise ship port, to catch the Flam railway. The train trip up the mountain was pleasant but the bike ride down was the real highlight. 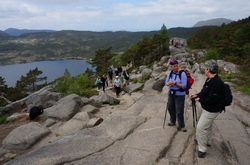 We descended 866 metres in 20 km. The path was rocky gravel down the switchback at the start but improved to be sealed but with traffic from the halfway point. Spent the night at the youth hostel campground. We started the day with a 25 km tunnel on our way to the Borgund stave church. The timber for this church was felled in 1180 and it is the oldest unaltered stave church in Norway. It is quite small but interesting. 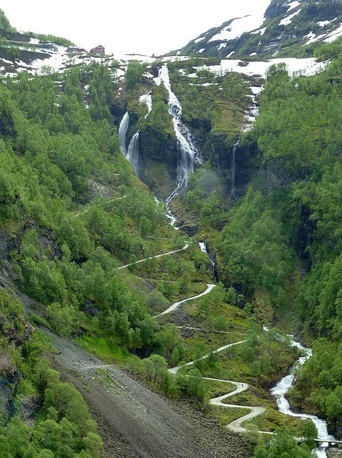 Yet another tunnel passing under a glacier before arriving at Mundal – a town accessed only by boat until the mid 80s. Now noted for its books for sale. Passed by the Glacier and Climate museum but decided our interest level didn’t warrant the $20 admission fee. That seems to be the common admission to most attractions and museums. 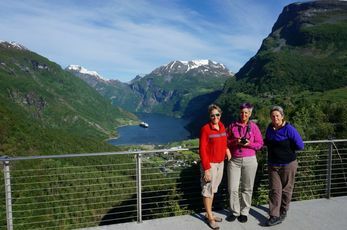 Barb, Deb and Cheryl in front of the unreal looking Gerainger Fiord. 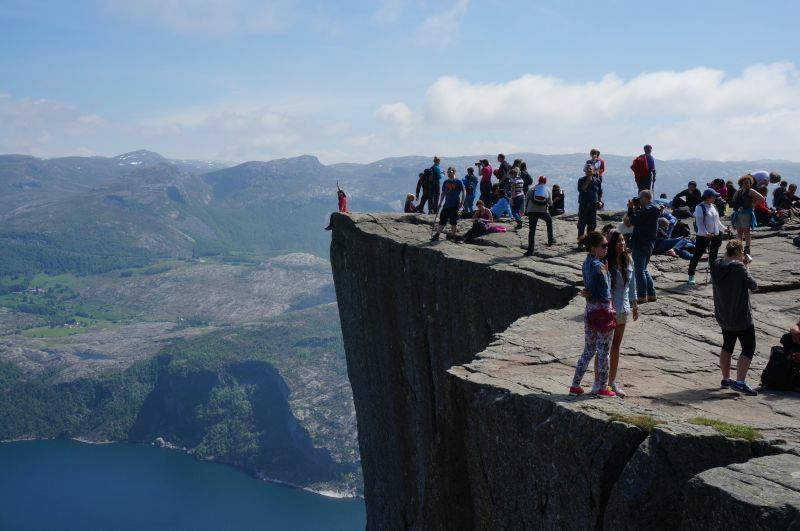 We decided to drive to Geiranger Fiord and take a 2 hour ferry ride along the Geiranger Fiord to Hellesylt. 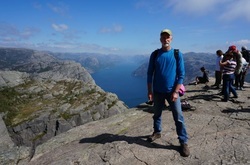 The steep sided fiord and many waterfalls made it very enjoyable. More tunnels and beautiful scenery as we made our way to Alesund for a day off. The ferries aren’t free with smaller crossings about $18 and double that for a vehicle over 6 metres. We just squeeze under 6 metres …kind of. Some newer tunnels are also costly as well as some roads. There is also a congestion tax levied when you drive in AND out of the larger towns. Diesel is up to $2.65/litre and petrol is even more expensive. A day off in Alesund. Decided I needed a haircut…nothing fancy, no washing, curling etc at a small no appointment hairdresser nearby. I had to wait for 45 minutes and then after 20 minutes of cutting I was $98 poorer. Gobsmacked I pulled my card out. I saw others pay more. This rich in oil country has very high wages and very high taxes. Cappuccinos are around $8 and that’s not a mug, a packet of chips about the same and even basics like fruit and vegetables are taxed. 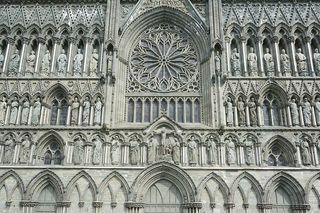 We have a few driving days ahead as we go through Trondheim with its Nidaros Cathedral. 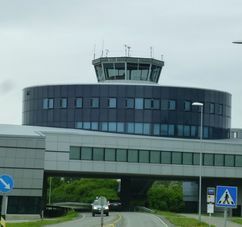 The royalty of Norway are crowned here. 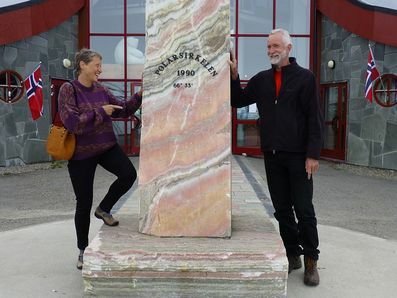 The next big milestone was crossing the Arctic Circle to Bodo via the Saltstraumen. Land of the midnight sun now. Still heading north we drove beside the strong flowing Namsem River. We stopped at a Laksavarium, a fish ladder for the salmon to bypass the dam wall. We were a bit early to see them jumping up. We crossed the Arctic Circle.There had been trees before the crossing and after it, but it was bleak, cold and bare there. 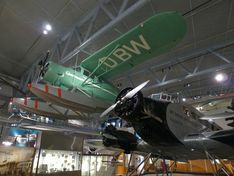 Decommissioned cab moved to the aviation museum. Then drove to the Saltstraumen Maelstrom to see the tide go out through the narrow channel as the water swirled and popped but it was not as spectacular as I thought it would be. 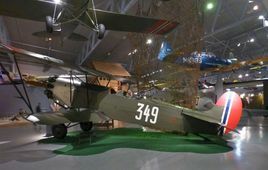 Nearby Bodo had the best aviation museum I had ever seen with not just military and civil aircraft on display but quite a good description of ATC – civil and military, airspace, navaids, radars and following a flight from getting weather and notams to approaches, landing to parking. We caught the afternoon ferry from Bodo to Lofoten Islands. It was impressive to see the sheer cliffs of the Lofoten Islands rise up from the sea. Good that the sun doesn’t set also as the ferry arrived just after 8pm. We drove to Å to camp. We spent 3 days driving north through picturesque Lofoten Islands stopping to see quaint fishing villages and a couple of museums. Very touristy and like most of Norway so far, there were a lot of motorhomes. The weather was very changeable but not much rain. Left Lofoten eastbound towards Sweden and Finland.